Warped loom and wove off about half of the warp (color samples and 3 towels). Cooked Thanksgiving dinner, including 3 pies. Cleaned studio for a few hours. Knit most of a sock foot. Piles and piles of laundry. I ended up watching more football than planned with a cat and no knitting on my lap. And reading more news and Facebook than I really wanted to. This week, I'm recommitting to consciously using social media and news apps--this weekend I slipped back into the mindless surfing habit, and my creative productivity, sense of well being, and blogging suffered as a result. I've set 3 non-work goals for this week to keep me on track--and I'' sharing them for a bit of public accountability. Practice yoga every weekday (2 classes and 3 times at home). Write something (blog or journal) every day. I haven't formally participated in the Me Made Monday challenge, but I aspire to. And I'm a lazy blogger who has a pile of California propositions to study tonight. So I found a half-baked post about a sweater I finished over 4 years ago and then never wore because it had problems. I did fix it and add it to my wardrobe. Here's it's story. 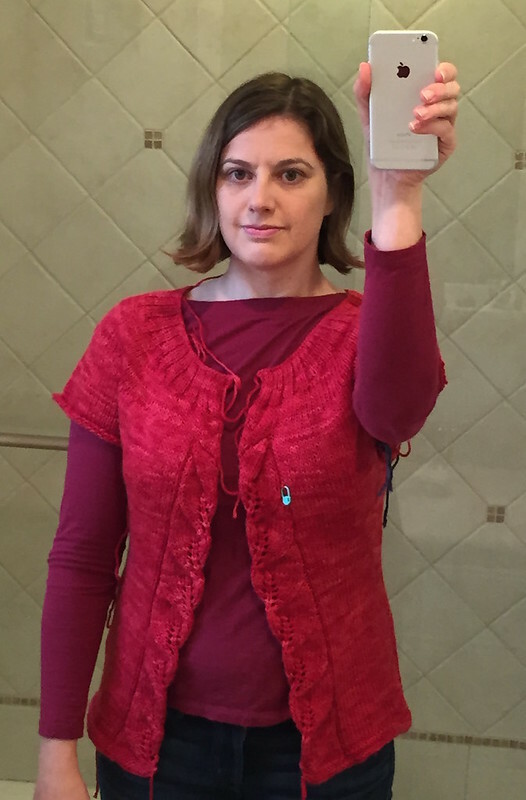 The sweater is a cute pattern, but the wide neck of the yoke constantly slipped off of my shoulders. The designer was in my SOAR 2012 workshop, and she recommended crocheting around the neck to tighten things up when she saw me wearing this sweater. Thanks to multiple moves in a short time, I spent at least a year with either the sweater, the leftover yarn, or a crochet hook to hand, but never all three at the same time. Eventually, I found my stash of Nonny's crochet hooks and the leftover yarn. Then, I cut apart the top of the keyhole, unraveled the excess i-cord, and grafted again. Then I ran a croched slip stitch all the way around the neck. Voila, a sweater that sits properly on my shoulders. 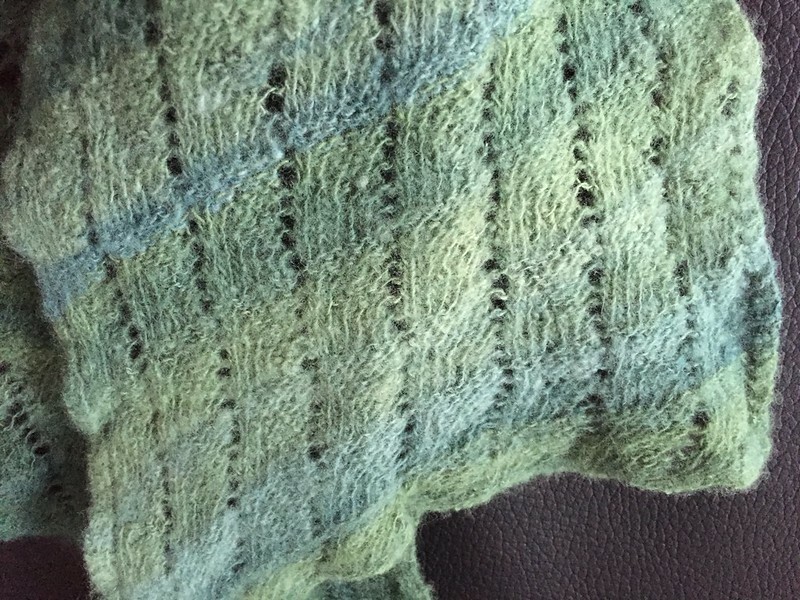 The details, or proof that I did sometimes finish sweaters during the long years of bloggy silence. Time: Knitting February 2011 - March 2012. Less than 1 hour to fix on January 2, 2015. Comments: This was a fun knit and I do love the style and fit of the fixed sweater. I got stalled early on because I needed to figure out short rows for the bust, and they're perfect. Over the past 17 years, I've made a blanket for each of my nieces and nephews. I try to deliver them at about the time each kid graduated from crib to bed or when the oldest's world was massively disrupted by younger siblings. Clockwise from left: Tamarix Quilt for Miss Z, Rambling Rows for Master A, and Chevrons for Miss T. Pre-blog and a few computers ago I made 3 others; I tried to find pictures of those tonight with no luck. Over the years I've caught these blankets in action for blanket forts and naps. I've repaired them. I treasure the photos I have of my favorite kids with their blankets. The last one (unless someone suddenly has another baby) is on the needles right now. For some reason, I decided to knit another garter stitch log cabin variant; this time the Parcheesi Afghan. I expect to spend as much time assembling and weaving in ends as I will knitting. Since it's my exclusive project for this month (and is suitably brainless for after work TV), I hope to finish it this month. I sped through log cabin squares during the summer and started the stripey borders a few weeks ago. Before I could start all those striped sections, I finally made a blanket for myself. I loved knitting the Vintage Missoni Inspired Chevron Blanket for Miss T, so I planned one for myself when I found out that Cascade had discontinued their cotton-wool blend Sierra and Webs had it on closeout. I spent a lovely hour in the warehouse playing with color for the last niece blanket and my own. Since there is some color crossover, and my blanket had a specific plan, I needed to finish mine before I could complete Miss A's. I love it! For something so big, it's a quick knit. I made this one in about 10 weeks. Considering it was an at home only project, that's speedy for me these days. All the details are in Ravelry. Going to the New York Sheep and Wool festival has always been a treat for me. Even when we lived in the northeast, I did not attend the festival every year. The first year I knew about it (mid-1990s), David and I flew over the festival on a Saturday afternoon adventure in our small plane, but I didn't get to explore on the ground. David and I made a trip or two when he was in school. I drove up with friends from DC in 2009. Three years ago, I ran away from the chaos of getting our house ready to sell to bid farewell to fall in the Hudson River Valley and many friends. This year, the stars aligned me to to to Rhinebeck. My vacation time balance has been hovering near the maximum all year thanks to no SOAR. I have a big bank of frequent flier miles thanks to too much business travel. Most important, friends invited me to stay with them in Red Hook for the weekend. I worked until 2 hours before a red eye flight to New York Thursday night. I took the train from NYC to Rhinebeck and savored the beauty of the Hudson River and the bare hint of red at the top of the cliffs across the river in New Jersey on Friday. This year, I focused on spending time with friends. I spent a lot of time at a picnic table catching up with my Ravelry tribe. I wandered the barns with the friends I stayed with and saw everything through 9 year old eyes. I soaked up the riot of color in the barns, on the fair-goers, and in the trees. I looked at yarn and almost always thought I have something just like it at home. I fondled fleeces without buying; it's easy to resist when faced with stuffing 8 pounds of raw wool into a tiny suitcase and hauling it back across the country. I admired sweaters but cannot recall any in detail. I probably missed seeing and talking to more friends than those I bumped into. I took surprisingly few pictures. I unwound and played in the leaves. I ate all the treats: apple crisp, cannoli, bratwurst, lamb stew, artichokes French, maple cotton candy, and apple cider donuts. After Rhinebeck, I spent three days in New York City. I saw a few colleagues, ate well, went to the Cooper-Hewitt, and walked all over the place. It's been a long time since I spent any non-work time in New York. In the end, I did buy one bump of fiber, the festival tote bag, some soap, and an irresistible curly maple Travel Kate. More importantly, I came home full of hugs and joy and inspiration. 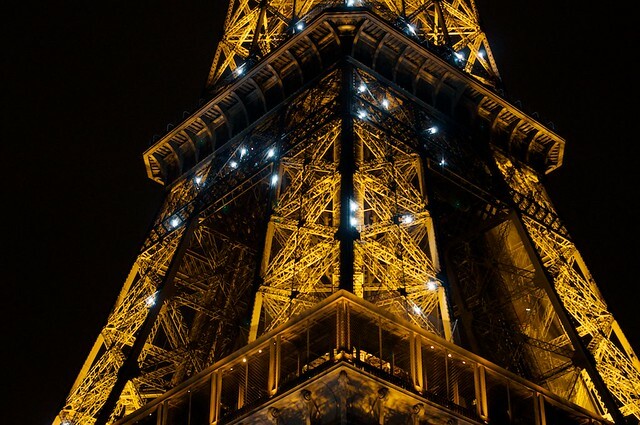 I've already written about my words for 2015—practice and finish. Choosing guiding words for the year is the first step in making changes. I've spent the last week or so reflecting on exactly what I will practice and finish this year. Since Carole's theme this week is intentions for 2015, here are 10 concrete things I will practice or finish in 2015. Practice writing daily. Writing well requires practice. The only way past writers' block is through. Finish 2 blog posts a week. I will let go of perfectionism and send my words into the world. Practice commenting on other people's blog posts. I am a big reader and infrequent commenter. The best way to maintain the community of friends I initially met through blogging is to keep reading and commenting. Practice photography. I enjoy taking pictures; I'm sometimes good at it; and the only way to improve is to take more pictures. The whole family gave my niece Miss M a DSLR for Christmas this year. I'm looking forward to seeing the world through her camera--and I hope she enjoys seeeing the world through mine. Finish processing pictures soon after I take them so I can print a few to fill the vast empty spaces on our walls and share the best pictures with the blog and the world. Practice yoga 4 times a week (two classes and twice at home). Why is taking better care of myself so challenging? Regular practice brings better sleep and better physical and mental flexibility. In my life right now, both are incredibly important. Practice knitting a few projects frequently. I mean knit only two or three projects actively at a time instead of five to ten. Make steady progress on those two projects every week. Finish projects that deserve finishing and rip out those that do not. Ripping out the projects that are not going anywhere is liberating. It removes the psychic weight of a to do from the back of my brain. And threatening to turn an almost garment into a big ball of yarn brings readers out of the woodwork. Practice cooking dinner from scratch instead of from boxes and restaurants. Life may be calmer this year. We bought this house because it has a spectacular kitchen that I love; if I'm not going to use it, we should have bought a completely different place. Practice spinning. For me, spinning is more about the meditative process of turning fluff into yarn and less about the eventual finished yarn. Spinning also calms my monkey mind and improves my focus and flexibility, and I need as much of that as I can get. These 10 intentions aren't my only plans for 2015. I hope to read more books than I did last year and watch a lot less television. David and I have a few trips planned already, and I'm sure we will plan more once we survive our big work commitments early in the year. I'm going to keep working on my curling game. And there is quite a bit on my professional plate that will stretch my skills and keep my job interesting. Yes, I do still knit. Occassionally, I even finish things. When I do not blog regularly, I am truly terrible about documenting the few projects I do finish. A perusal of my Ravelry projects shows quite a few no photo projects. As I wear my collection of handknits this winter, I plan to take pictures of them so that my Ravelry projects become a useful history of what I do accomplish. Comments: My scarf is 7 repeats wide instead of the 5 called for in the pattern. I prefer wider scarves, and the Haiku put up is longer than some other silk-mohair yarns. I worked 25 or 26 repeats—until I ran out of yarn. I started this project one weekend when I was uninspired by the projects I had handy and David was out of town. I wandered into my studio and looked at the shelves of yarn and a skein of red dove off the shelf into my hands. 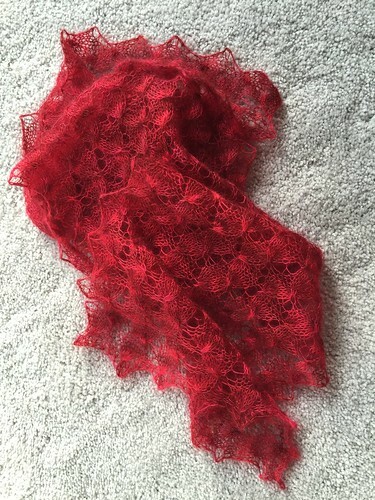 The lace has a cable cross with a double decrease which gives the finished fabric a bit of body you don't usually get from silk-mohair laceweight. It makes the finished scarf even more cuddly. I look forward to adding it to my rotation of scarves this winter. This pretty red sweater has been in time out since spring because I'm nearly out of yarn and worried about fit. I finally blocked it last weekend to get a better read on how it fits, and I was right to be worried. With the addition of a button band, the cardigan will close at the bust without pulling but not at the waist and hips. The fabric has almost no body after blocking. It's superwash yarn knit to the ballband gauge, but the resulting fabric seems a little bit sleazy to me. I worry that the sweater won't keep its shape well. The swatch seemed fine, but the added weight of the entire sweater changes things. Given the constraints of the remaining yarn, I have a few choices. Put the whole mess back into storage and revist the problem if I ever loose 10 pounds. If I knit the button bands, I might have enough yarn left over for elbow length sleeves. And I'll have a sweater that only kind of fits. I probably have enough yarn for long sleeves if I skip the bands. I'm not sure how I feel about wearing an open front cardigan. Given the looseness of the fabric, I'm half inclined to rip out the whole sweater and figure out something else I can do with less than 1000 yards of worsted weight superwash yarn. The first option goes against my resolution to resolve my collection of half-knit sweaters. The next two will result in a sweater I'm not sure I would wear. I am not a fan of top buttons closed only cardigans on me, and I prefer longer sleeves over shorter ones. I have to admit that I'm leaning toward starting over. Claudia's post today about the slowest way added that option to my list. I would rather re-knit and have a sweater I love than struggle to finish one I don't wear. Carole's prompt this week is all about shopping. Where do we most like to physically go to shop? For an avowed non-shopper this wasn't easy. It turns out that I don't like to shop for clothes, but I really do enjoy shopping for other (yarn) things (food). It's no surprise that the list is heavily weighted to yarn even though I haven't fallen in love with any local yarn stores in my new home town. Now that I've made the list, I'm yearning for a trip to the east coast to visit my favorite places out there. Fibre Space was my home away from home for the last few years we lived in Alexandria. I haven't visited in over three years, and that makes me incredibly sad. I'm going to try to persuade David to stop in for a visit (and some holiday shopping) while he's in Washington, DC, this week. But I doubt that my clever plan will fly. Iron Horse was my local yarn store in Natick. I visited frequently and always stayed longer than I had planned to. It was just close enough to home that I could run in for a quick stop during lunch or for a longer visit on Saturday mornings after my farmers market stop. Debbie raises sheep and goats, has the fiber processed into rovings and yarns, and then dyes the yarns in beautiful colorways. I also visited Gather Here in Cambridge, MA, frequently during our brief return to Massaachusetts. I met friends frequently on Saturday mornings for chatting and knitting and shopping. Churchmouse Yarns and Teas in Washington is another favorite. I love their well laid out stylish store patterns and the wide variety of yarns and teas they stock. I'm still tickled that I managed a visit when I was in the area two weeks ago. Zanotto's Family Market is a classic corner grocery with a gourmet twist. It's closer to home than either Trader Joes or Whole Foods, so we do much or our produce and meat shopping there. Their prepared foods are excellent; we had a tasty cranberry pecan relish for Thanksgiving that was so much easier than making my own, and I'm a big fan of their fresh salsa. I have been a fan of Penzey's Spices for over 15 years. I am so happy that there is a reasonably convenient local outlet on the Peninsula. I always make a list before I go, and I usually end up with twice as many things as I planned on buying. On the nights when I just want something tasty for dinner I reach into my drawer for one of their blends—Ozark, Northwoods, and the Maharaja Curry Powder are my go to favorites. Sur la table. Yes, it's a national chain, but a good one for kitchen basics and obscure utensils. I ran over during Saturday's candy making spree to pick up a set of chocolate dipping tools. And came home with a few other things as well. I window shop at Nordstrom for aspirational style. I find it overwhelming, but a whole lot less overwhelming than Macy's. I've also had some great experiences working with their personal shopper service. As I get deeper into my wardrobe refresh, I will probably meet with a shopper again to refresh my investment quality wardrobe staples. And, I buy quite a few pairs of shoes from Nordstrom because they reliably stock my hard to find size in high quality brands. I buy close to half of my clothes from Loft. Because they sell jeans that fit me well, and they are everywhere, they've become my default stop for every day business casual basics. I'm not proud of this I'm not always pleased with the quailty, but it's easy to get into a clothing rut. I'm trying to break myself out of it, but I haven't been 100 percent successful yet. I just discovered C. Wonder and have fallen in love with their classic button downs in great fabric combinations and wide assortment of silk blouses. This shop is replacing Loft as my go to stop for everyday wear to work clothes with a modern preppy vibe. 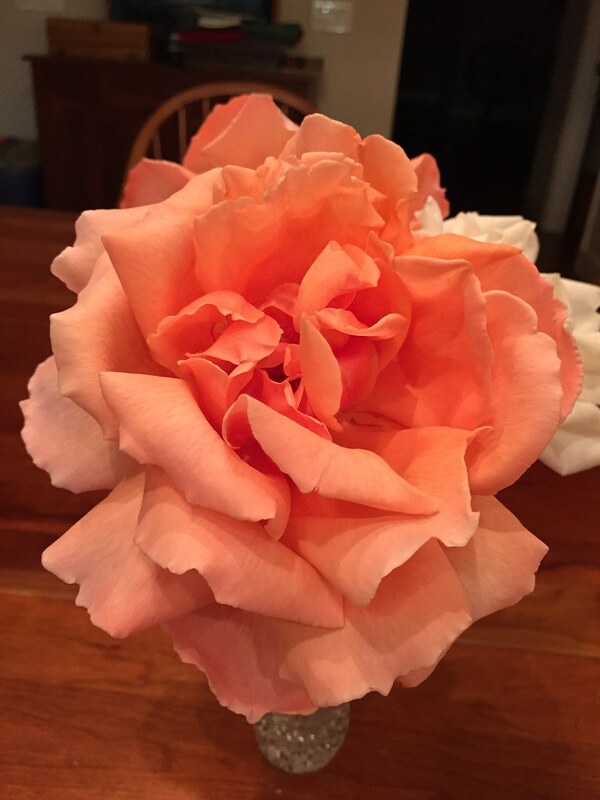 Yesterday, I spotted a surprise in my yard—blossoms on two of the rose bushes. We've been so busy, I pretty much missed the buds. I cut three flowers for our Thanksgiving table. I hope your Thusday was as lovely as mine and that holiday happiness exceeded holiday stress. I spent time with family and cooked: pies, roasted chicken, mashed potatoes, cheesy wild rice, and roasted green beans. 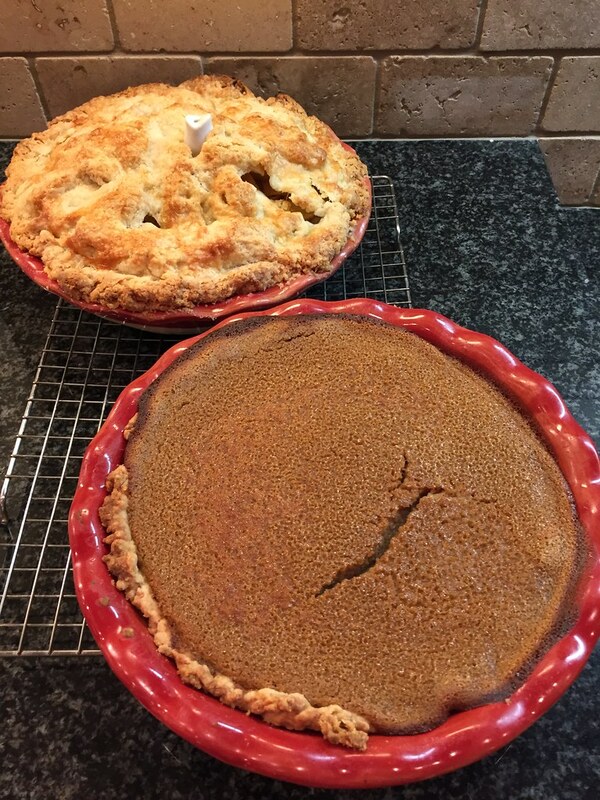 Activities that always make me happy, even when the pie crust doesn't quite cooperate. We visited via Skype with the Wisconsin contingent of my family. Best of all, everyone pitched in to wash dishes, so my dishwasher-less kitchen is clean. Everything is clean, and almost everything is already put away. And I knit a bit. The red scarf is ready for blocking. I started a giant swatch with the yarn I bought last week. I hope it doesn't lie. I went to Rhinebeck in 2009 with many friends. We had a lovely weekend of chatting and eating and enjoying all the joys of the New York Sheep and Wool Festival. I bought a bump of cormo roving from Briar Rose Fibers and a mini from the Bosworths and started to spin. My general goal was to match Malabrigo Lace. 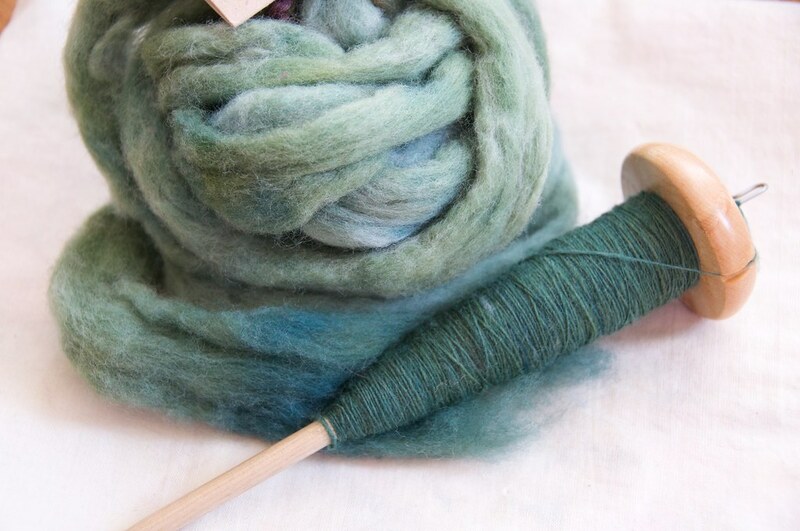 The spindle and fiber lived in my travel kit and were my travel spinning for almost three years. 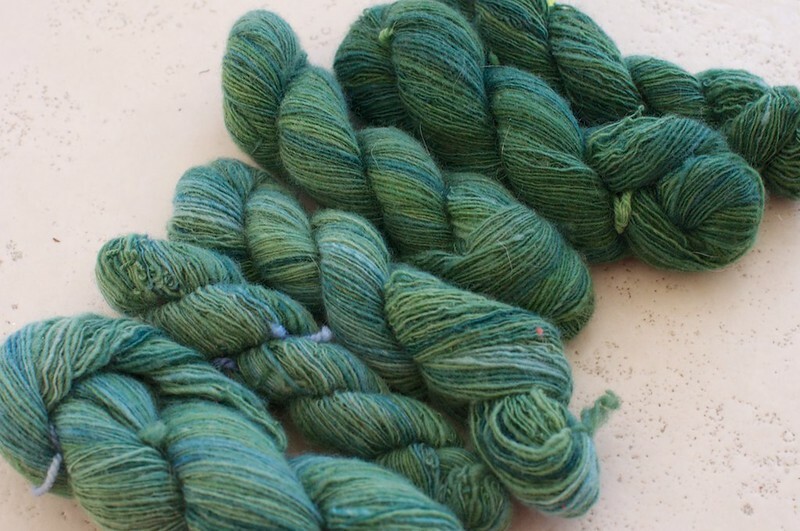 By the spring of 2012, I had a pile of yarn—about 600 yards of soft squooshy possiblity. 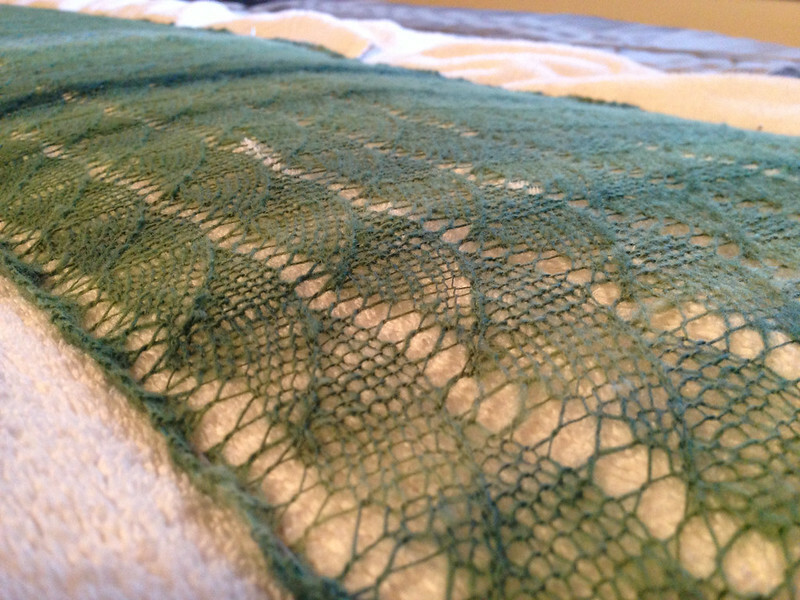 By June 2013, I knew what the yarn wanted to be (or at least what I wanted it to be). 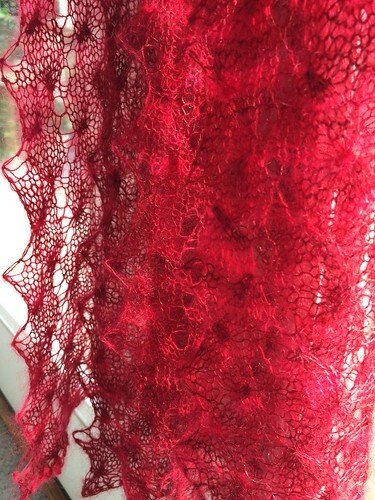 I spent my summer travels turning all that lovely yarn into a lightweight wispy scarf I called Windblown. I cast off with only a few inches of yarn left on my flight to Maui for our 20th anniversary celebration last August. I blocked Windblown in September and wore it throughout the fall. In December, I left it in a restaurant in Portland; lucky for me a kind person rescued my scarf and mailed it back to me. I continued to wear my scarf all winter, even though it was barely cold enough. In April or May, I carefully washed Windblown with all my other woolens in preparation for summer storage. And things went horribly wrong. I set a load to soak and spin in the washing machine. I hung up the sweaters and socks, leaving Windblown and another handspun lace scarf behind. I intended to go back and pull them out to block on wires and pins. In my rush to finish all the laundry that day, I forgot they were still in the machine and ran another load. I was sick to my stomach when I unloaded the washing machine and found two crumpled forlorn scarves at the bottom. I pulled them out and stretched and prodded and prayed, but water and agitation had worked their magic on the wool. The orginal Windblown was light and airy and maybe a bit too long; the new Windblown is cushy and snuggly and the perfect length. Yes, I'm looking for the bright side in what felt like a disaster at the time. But I really do love the fulled scarf as much as the original. I just wish that I had intentionally fulled something else and not a project I spent nearly four years and hundreds of hours making. And now I always double check the washing machine before loading it up for the next load.